A proper roof treatment is a critical component to overall roof maintenance. While cleaning your roof is beneficial, without a roof treatment (which most commonly is applied for moss control) you will need to have your roof cleaned much more frequently. This is actually just the opposite of what your objective should be – you want to avoid cleaning your roof too often. 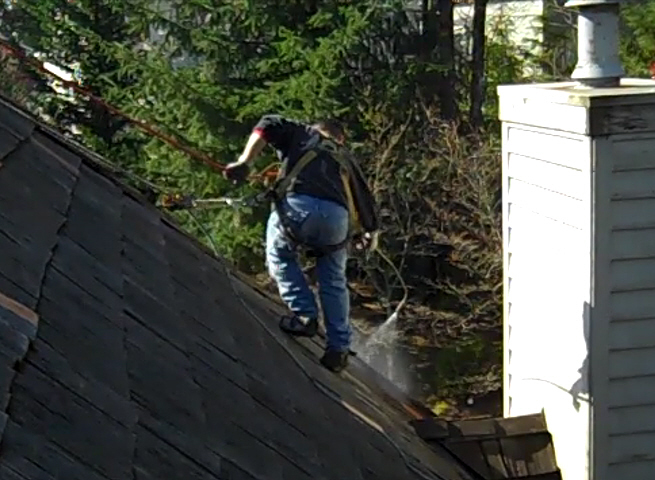 Once a roof has been cleaned, regardless of method, a roof treatment should be applied. A proper treatment will kill the remnant of smaller moss left behind. No roof cleaning method removes 100% of the moss and sometimes, those methods that remove the most initially (power washing) do so at the expense of deteriorating the roofing material. Beyond acting to kill the remaining moss, the treatment then serves as a preventative to keep the moss from returning too soon. How long this moss preventative will last depends on the type of roof as well as the immediate environment surrounding your house. This is why we recommend that once a roof has been cleaned and treated for moss, you do not wait until the next infestation comes knocking. Rather, either on a pre-scheduled time frame or at the very first instance of seeing even the most minor tinge of green on your roof, you want to get it re-treated. Not only is this long-term strategy more gentle on your roof, it is also more affordable. One final point in regard to roof moss treatment; sometimes a treatment is all your roof needs. This is applicable if similar to the periodic re-treatment scenario mentioned above, when there is only a very small, and young moss infestation. In such a case, a treatment might solve your problem without requiring cleaning. However, be aware, even an excellent roof treatment, if applied on too mature and heavy of a moss infestation, will not solve the problem and just end up being a waste of your money. There is one other aspect of treating your roof. Some roofing materials, such as cedar shakes, additionally need protection from rot and the sun’s UV rays. Treatments can help protect against this. The best roof treatments, like our proprietary CedarGuardTM, have synergistic benefits such as helping reflect harmful UV rays. Always try to avoid dark colored treatments as they act to absorb unnecessary amounts of the sun’s rays. What all this points to is that you need an experienced professional to review your roof. Resist the temptation to accept bids from any company that attempts to give you a phone estimate based on the approximate size of your roof. This is folly. There is much more to roof treating than just the size of your roof. If you are ready for an experienced professional to take a look at your roof, call us today.